What About Paris? : Potomac Boat Club. 3530 Water Street, N.W. Potomac Boat Club. 3530 Water Street, N.W. 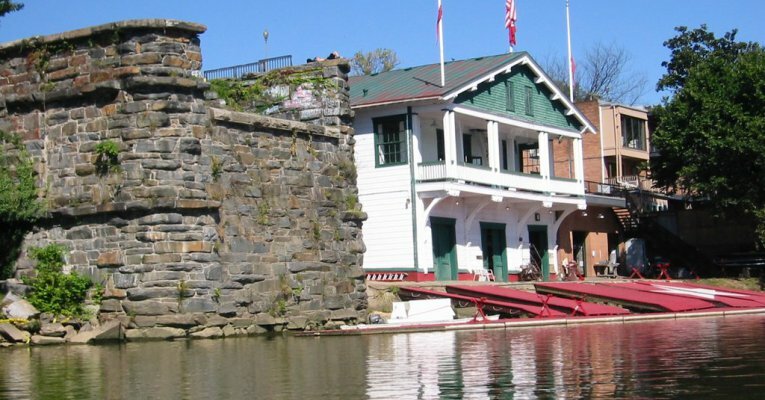 Established in 1859 as the "Potomac Barge Club", the Potomac Boat Club is a rowing club on the Potomac River that sits on half an acre along Georgetown's southwestern border. It hosts several hundred members: recreational rowers, Washington-Lee High School crew team and professional athletes. Two members, Larry Hough and Tony Johnson, won the silver medal in coxless pairs at the 1968 Summer Olympics in Mexico City. The club's current building (below) dates to 1908.